Able Planet’s Clear Harmony Noise Cancelling headphones missed being involved in the headphone head to head, so we’ll never know if they can block the sounds of someone chomping on a bowl of Rice Crispies, a loud and inconsiderate Dom Jolly type on his mobile or the beating of a cereal bowl with a metal spoon. But given the headphones I tested in the head to head battle were a previous pair of Able Planet headphones which were pretty impressive, and retailed for a fraction of a price, it was already clear these headphones were going to surpass it cheaper sibling. So I had a little play around with them, blasting out a bit of Linkin Park and Britney Spears to put it through its paces. And I must say I was impressed with how well they muffled background noise and made me feel as if I was in my own little audio bubble, which is great for the music listening experience, but can be a bad thing in terms of making you oblivious to everything on around you (so you must keep your wits about you). Apparently, the secret behind the headphones sound is a proprietary Able Planet Technology called Linx Audio, a technology that was originally developed to increase speech clarity for a new generation of high-end hearing aids. Its purpose is to increase the intensity of higher frequency harmonics in order to make it easier to hear words or notes that would otherwise be lost in higher frequencies. The noise cancellation is fantastic, and they deal with background elimination very *very* well. 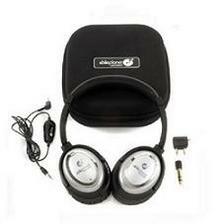 What I also like about the headphones is they can be used with or without batteries, unlike other headphones of the same quality. Of course this means, when the batteries aren’t in the noise cancellation is out of use, but hey, it beats what my current headphones can do – the Dr Dre Beats (no pun intended). The bass is brilliant, volume levels are equally fantastic and if noise reduction is the top of your headphones priority list, this would make a great pair of headphones. Design-wise, the headphones are lovely and any audiophile would be proud to wear them, but the $350 price tag is definitely not an incentive to make the purchase. Get a pair from Able Planet.